It's been some time since I published a post in my data analysis series. Following WJAX and Devoxx it's finally time to look at Jfokus. As usual, this was compiled from the sources available (compare links at the end of the post). 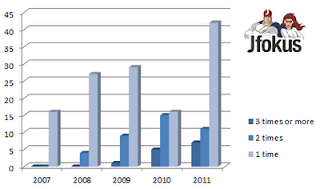 The CfP for Jfokus 2012 is open until October 1st. Jfokus is the largest annual conference for software developers held in Stockholm, Sweden. The focus is system development with Java and surrounding techniques like Scala, Groovy and other dynamic languages. Jfokus also covers Android, HTML5, Cloud and agile methodologies. Attendees travel to Jfokus from most countries in Europe and a few from the rest of the world. During three days in mid February, you will have an great opportunity to keep yourself updated with the latest development through numerous interesting sessions. Jfokus is the best way for you to get the latest trends and buzz from people who live and breathe technology. Compared to Devoxx and WJAX this is probably the smallest conference in terms of attending speakers. Even in the nearer past they still don't reach the maximum of the other two. What is true for the top speaker is also true for the general distribution of the speakers. 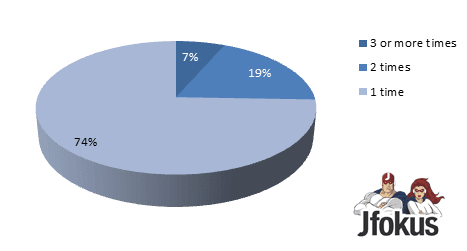 Compared with both Devoxx (19%) and WJAX (25%) there is an awesome small amount of returning speakers at 7%. If you are looking for fresh faces you probably have found the conference to attend. This seems to be a fresh conference. Very few returning speaker and always new topics to listen too. This isn't obvious from the plain numbers of course. You could also argue, it must be a bad conference for speakers. But looking at the speaker names attending year after year it's quite obvious that this is not true. Some of them clearly wouldn't attend a small and badly organized conference. So this is anything but an accident. Let's speculate, that this is volitional and there to embrace change and new topics. A very brave decision. Thanks to @matkar for providing some additional information and logos!